You will notice that there is No picture attached to this blog...that is because I'm going to talk about the shot that I missed. One lesson learned...ALWAYS HAVE YOUR CAMERA READY!!!!! It's about 8am and I am driving down Tioga Road headed towards Tuolumne Grove (Giant Sequoia Grove) when out of the corner of my eye I see a black spot out in a grassy meadow. I knew that it was some type of wildlife so I turned around to get a better look. As I pulled up to an opening in the trees I saw a scene that I have been looking for all of my life. The grassy meadow was so green from the spring rain and there it was...a black bear in the middle of the field grazing. Behind the bear was a perfect row of Ponderosa Pine Trees and behind the trees was a snow covered mountain. I couldn't ask for anything more. As quietly as I could, I got out of my car and opened up the back door to get at my camera gear. I opened my bag, pulled out my camera and attached my lens. I am so excited that I am going to get a shot of a lifetime...and this is the first bear I have ever seen in the wild! Too good to be true...right? Well, when I looked up from my camera, after getting all of my gear together, the bear had drifted off into the woods. Nowhere to be found. I was so disappointed that I didn't have my gear ready to go! I was so disappointed that I wasn't going to capture this once in a lifetime photo. Then I realized, it isn't always about getting the shot...it's about the experience that you have on your photo journey. So what...I didn't get the shot. I will forever have this picture perfect image in my mind! But rest assured...I will always have my camera gear ready to go at all times so that I don't miss the next opportunity! 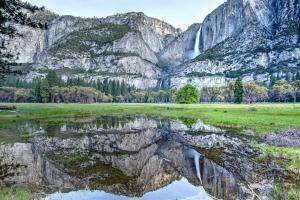 The National Parks in the United States are, what we consider, our National Treasure. Preserved in a time capsule, they are a reminder of what this world once looked like before humans began tearing it apart. On a recent trip to Yosemite National Park in California I was amazed at the sheer beauty of the landscapes. The view of Half Dome from Glacier Point, seeing El Capitan and Bridalveil Falls from the Valley View turnout and hearing the sheer power of Yosemite Falls from Scotts Meadow are enough to leave you breathless. I also witnessed the worst of humans on this trip...and many of these actions were by my fellow photographers. I witnessed photographers stepping over fencing in the park to try and get a shot regardless of the environmental impact. Little did they realize that the area they were stepping into was a location where birds would lay their eggs in the grass. Who knows how many eggs were damaged in their journey to get their shot. There were people feeding the wildlife human food and cars blasting their horns in the tunnel near the tunnel view overlook. Each of these things left me wondering how we can consider ourselves a superior being on this planet. When I retuned home I read an article how a tourist took a bison calf in Yellowstone and put it in the back of their car because the thought it was 'cold'! Idiotic! I am not writing this article because I didn't enjoy my trip to Yosemite...I did enjoy it. It is one of the most beautiful places I have ever been to. I am writing this article to remind anyone reading it that it is our responsibility to protect these incredible locations. I suggest that if you want to learn more about the National Parks that you watch the Ken Burns Series - 'The National Parks: Americas Best Idea'. It will take you through the journey of some amazing individuals that made our parks a reality. I also wanted to share my 'tips' on how to enjoy your trip to the National Parks without leaving your footprint on the environment. 1. Educate yourself before you begin your trip. Review the National Parks web page to familiarize yourself with the park itself and the park regulations. 2. Research to see if the park has guides available. On my trip to Yosemite I paid to go on a guided tour with a photographer from the Ansel Adams Gallery. The guide is very familiar with the park and was able to guide me to some great locations. They also helped me learn a great deal about the park and how to protect it. I took my guided tour on the first day in the park and it set me up for a fantastic week. 3. Walk in permitted areas only. If there is a fence...stay behind it. You may think that it's only a few steps into that area to get the perfect shot...more than likely you are not the only one to think that way and before you know it...hundreds of people are stepping in to protected areas. That perfect shot just isn't worth it. 4. They call it wildlife for a reason. They are not meant to get close to! They are not meant to be fed human food. They have survived for thousands of years without our help in the past and they don't need it now! My guide shared with me that most of the injuries that happen in the park are tourists getting charged by bison in Yellowstone! They are not big slow animals...they can charge at 30 MPH's before you even have a chance to get out of the way. Keep a safe distance and allow them their space and they will not bother you. 5. If you see someone damaging the environment or going in to a protected area...SAY SOMETHING! Most landscape photographers do what they do because they love nature! If we want these beautiful locations to remain in tact...we must take it upon ourselves to do our part to protect it. I am amazed by our National Parks! Love taking in the fresh air, smelling the pines, watching an amazing sunrise at one of the scenic overlooks, but most of all, I love them because they take me back in time. They allow me to see what this land looked like before humans took over this planet. Help preserve this part of our heritage...keep the conservation of these parks in the forefront of your mind whenever you take your next National Parks Trip! Keep checking in as my next post will provide insight on the more technical side of my trip to Yosemite!